At the CTIA conference in San Diego, Samsung and Sprint took the wraps off the Android-based Moment, a touchscreen handset with a full QWERTY keyboard. 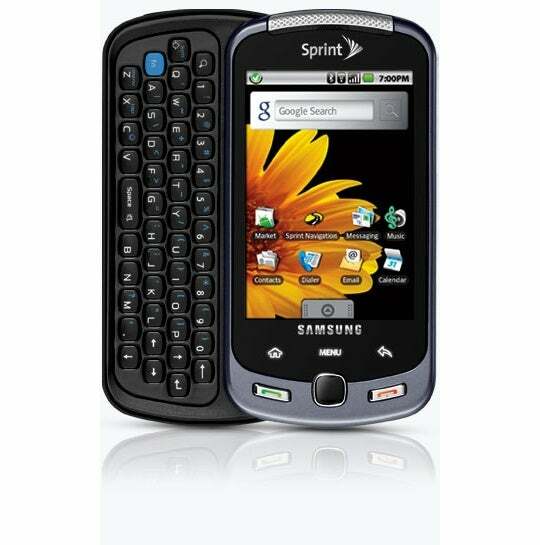 This is the second Android handset Samsung announced this week, following the Samsung Behold II on T-Mobile. The Moment will be available on November 1 and will cost $180 with a two-year contract. The Moment costs the same as the HTC Hero, Sprint's other Android offering. The Moment has a 3.2-inch AMOLED display, a technology that is becoming more and more common on Samsung handsets. A few of the benefits of AMOLED include better battery life, thinner hardware, crisper colors and a wider viewing angle. The Samsung Impression, an AMOLED handset we saw a few months ago, demonstrated the high quality of AMOLED display. I expect the Moment's display to be of the same caliber. The Moment has five hardware buttons lying below the screen: Talk, End, Home, Back and Menu. It noticeably does not have a dedicated Google Search button, which many Android handsets have, such as the T-Mobile myTouch 3G. Like other Samsung phones, the Moment has an optical mouse. I'm not really a fan of the optical mouse; I found the Samsung Omnia's mouse jumpy and not the easiest to use. I'll save my opinion for the Moment's mouse when I get hands-on time with it. Samsung said that the Moment's 800 Mhz processor will make Web browsing faster, provide smoother video playback and allow more multitasking. The Moment has a generous 32 GB of external memory, but no word just yet on how much internal memory it has. The Moment has a 3.2-megapixel camera with a flash, autofocus and video camcorder. For comparison, the HTC Hero has a 5-megapixel camera. Other features include visual voicemail, turn-by-turn GPS, Wi-Fi, calendar sync, Exchange support, a 3.5-mm headphone jack, stereo Bluetooth. And, because it is an Android phone, you get a suite of Google apps like Gmail, YouTube, GTalk and more. I'm interested to see how the Moment stacks up against other Android offerings, such as the Motorola Cliq (which has a similar form factor), the Samsung Behold II and the HTC Hero. Which Android phone is the most enticing to you? Check back for a hands-on review and further impressions of the Moment.